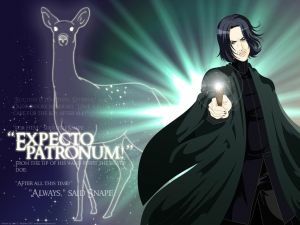 Personal Post | Expecto Patronum! Hey everybody. I have not forgotten this blog. I’m just flailing around beneath a huge pile of Research Papers at the moment. I should be back this weekend!!! And when I do return, I’ll respond to the comments that readers have been leaving. Thank you for reading and thanks for the comments. I’ll be back very soon now. Well, it’s in the nature of things that I fulfill my House Elf duties and let readers know what has become of me. In a nutshell, I started reading CoS… and then I got sick! 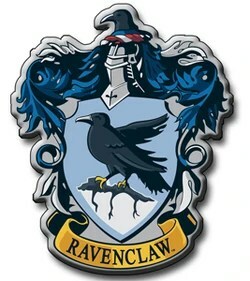 I’m fine now, but I haven’t managed yet to carve out some space to talk about Harry’s trip to the Burrow… and how the Weasley Twins introduce us to dark rumblings about Lucius Malfoy and the social status associated with owning House Elves. Please be patient. My teaching schedule has me going extremely long days on Tuesday and Thursday, which then has me playing catch-up on Mondays, Wednesdays, and Fridays. And getting sick did not help matters. Anyway, I’m still here. And I don’t intend to go anywhere. I just need to clear some space, and then I can post freely again. Hi everybody! My semester started yesterday, and I was assigned an entirely new class on Friday, so I spent the weekend working on a new Syllabus. Things should settle down a bit by the middle of next week, and I’ll try to sneak in another content-oriented post in the next few days. But I’m kind of jammed at the moment. Okay, folks. I’m getting prepared for the Fall semester – which means that I’m putting together syllabi for the classes I’m teaching. I haven’t done this in 10 years, and it’s amazing how much additional language you need to put into syllabi these days, given the more highly advanced state of technology. And then next week, I’ve got professional development activities on campus. And the following week… classes! What this means is that for the next week or so, I may just dribble out a post here and there. But I’m aware that I owe you a post on Dumbledore’s enchantment of the Mirror, a post on Quirrell’s seduction by Voldemort, a post on Harry’s encounter with Voldemort, and at least one post on Dumbledore’s explanation to Harry. I’ve also got guest posts lined up before we quit PS/SS. And then we’ll be ready to move on to CoS. In the meantime, I just wanted to draw your attention to some magic buttons. WordPress has kindly added a “Like” button to the bottom of each post. So if you like a post, please “Like” it. If you really like a post, Twitter has just today given you an easy way to broadcast the post through your Twitter network. And WordPress has decided to support it! To tweet a post, click the “Tweet” button at the bottom of the post. It will go out across Twitter… just like magic. So here you go… you wanna tweet? Tweet This! Well, it’s official. 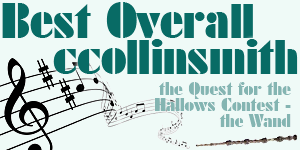 After completing four challenges, I won the “Quest for the Hallows” contest on the CoS Forum! 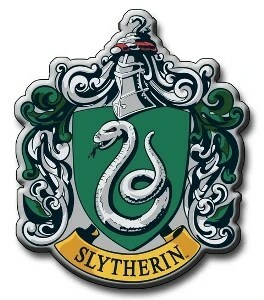 And that, according to Professor Dumbledore, makes me “Master of Death”… whether I like it or not. Task #1: The Elder Wand: For the Elder Wand task, we had to write a story (or submit a graphic) about one person who was canonically Master of the Elder Wand. I found the whole idea of writing a fictional story terrifying because I have always rather emphatically not specialized in fiction. 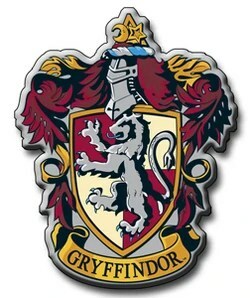 But I entered the contest to help my House (Gryffindor) get enough entries into the contest to rack up some House points. I honestly never expected to win anything myself. But I got an idea, and people really liked it. Task #2: The Resurrection Stone: Having done well in a task, I was excited going in to the next one. For the Resurrection Stone task, we could create a HP-related story (or image) or a Personal story (or image) showing how we would use the Stone. The most popular HP-related scenario was to bring Fred back so that George could say goodbye. But I did something entirely different. I was a bit confused by the task. When the instructions said you, I thought they literally meant me (not a narrator). Since I did not want to use the Stone, I came up with an elaborate workaround on how I could use the Stone without actually intending to use the Stone. 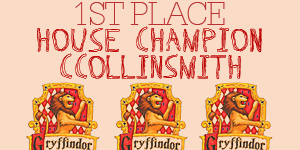 The entry took 4th place for HP-related story and 5th place overall. No banners this time, but I did get extra points. Here’s my entry. 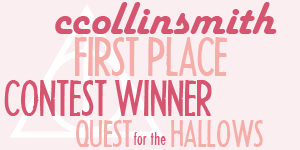 Task #3: The Invisibility Cloak: After placing in the first two tasks, I was one of the contest leaders. But this was the task that I thought was going to destroy me. We had to cover something that we never wanted to see again with a Cloak of Invisibility unlimited by size. But I just didn’t see any logic in merely covering something if the thing was still actually there. So I thought and thought and thought… and ultimately overthought it! Eventually, the only logical thing I could think of to cover was my garage. I didn’t want to remove the garage. I just didn’t want to see it. I knew I had no chance of winning the task the minute I saw the winning entry (Entry 17). But at least I placed 4th again! (oh, and here’s my entry!). 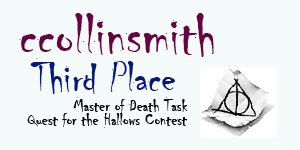 Task #4: Master of Death: Having placed in all three tasks, I was now in 2nd place in the contest overall, thanks to cumulative points. In the final task, we had to tell why we would or would not unite the Hallows and become the Master of Death. Within a day, I got an idea. How about a narrator from the distant future, looking back on the past – sort of like the Babylon 5 episode “The Deconstruction of Falling Stars”? 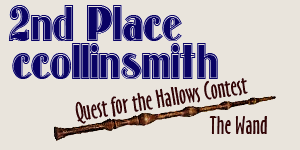 Eventually, this idea morphed into a post-apocalyptic Wizarding future in which goblins rule. I put all of my banners into that nifty little animated GIF that opened this post. It is now my sig pic on the CoS Forum. Okay… snarking is open now on the Comments thread! Have fun!